Throughout the year, almost 50% of the sun’s energy is absorbed into the earth where it maintains a constant temperature just a few feet below the ground’s surface. 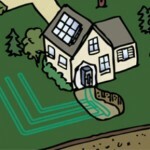 Geothermal technology takes advantage of this constant renewable energy source by combining a series of loops installed outside underground with a heat pump system inside that looks very similar to a conventional furnace. This combination of high performance technology allows us to tap into the earth’s natural heating and cooling properties to consistently and evenly distribute warm or cool air in your home or office throughout each season. An environmentally-friendly antifreeze solution or pure water carries energy directly from the closed- or open-loop system into the heat pump inside your home or office. In the winter, the heat pump acts as a furnace, distributing the heat throughout your home using the system’s heat exchanger and compressor. In the summer, it acts as an air conditioner, collecting the heat from your home and distributing it into your domestic hot water tank or back into the earth through the loop system. Not only can a geothermal system provide you with year-round indoor comfort, it can also provide inexpensive domestic hot water, supplementing or replacing your conventional domestic hot water heater. 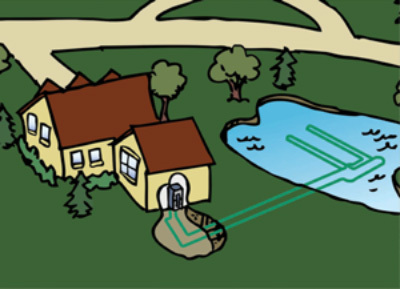 Each loop system uses GeoSmart’s high-density PE100 green geothermal pipe, the most resilient geothermal pipe available on the market today. 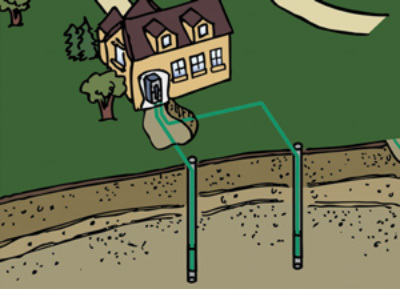 Once inserted in the ground, the pipe leads into the foundation of a building through a sleeve cemented into the wall and connects directly to your heat pump, bringing you years of worry-free, high-performance renewable heating and cooling using the earth as a natural energy source. 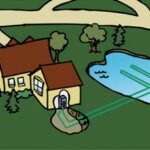 Horizontal loops are the most common type of loop system, and are commonly used in rural areas due to the land space needed for installation. An excavator will dig several trenches about six feet deep in the ground, each one up to 300 feet long. 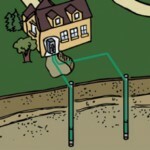 Our green geothermal pipe is placed in the trenches which are then back-filled with soil. 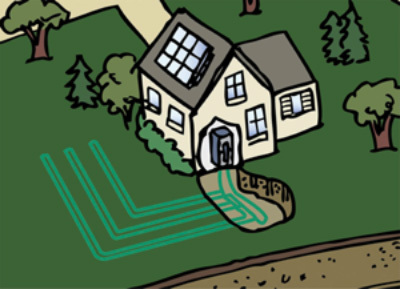 Geothermal heat pumps can dramatically reduce your annual costs for heating, cooling and hot water by as much as 75% per year. No other furnace, air conditioner or heat pump comes close to that efficiency. And they are cost-effective. Due to the amazing efficiency of a GeoSmart Energy system, the monthly energy savings realized by choosing our technology can often be enough to offset the investment associated with the installation the equipment. Want a detailed report? Your GeoSmart Energy dealer can use the GeoSmart Design Studio software program to estimate the heating and cooling costs for your home based on the calculated heat loss and heat gain, construction style and climate. Then you can compare it to your current energy costs to get an idea of how much money you can save. A GeoSmart Energy system operates more efficiently than ordinary heating and air conditioning systems—30 to 70 percent more efficiently, in most cases. For every unit of electricity the system uses, it provides four units of heating energy, giving a geothermal system a 400 percent efficiency rating, on average. These numbers can translate into real savings on your utility bills year-round. With continuous and dramatic volatility in the cost of fossil fuels like natural gas, propane and fuel oil, the savings possibilities are even greater in the future. 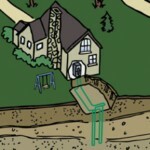 GeoSmart’s geothermal heat pumps are environmentally-friendly. In fact, installing a geothermal system in a typical home is the environmental equivalent of planting 750 trees—or taking two cars off the road. That’s because our systems don’t burn fossil fuels and they don’t emit carbon dioxide, which has been associated with climate change. Current geothermal system installations already save more than 14 million barrels of crude oil every year. 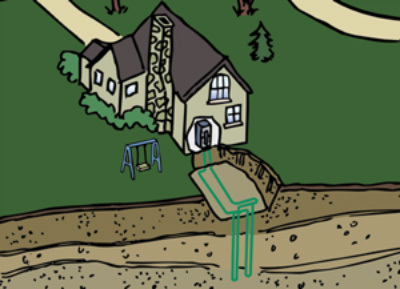 In fact, geothermal systems have been recognized by the EPA and the Department of Energy as the most environmentally-friendly heating and cooling technology available today. Unlike conventional furnace and air conditioning systems, geothermal does not require combustion to generate heat. This means zero risks to your family for carbon monoxide poisoning. It also cleans the air in your home using a high efficiency electrostatic air cleaner that filters out irritants like dust and pollen. So you can take comfort in knowing that your GeoSmart geothermal system works in harmony with nature and with your family.